Two men stand poised on opposite ends of the stage, their faces contorted in forced smiles as the din of applause slowly but surely dies down. Beyond the confines of the university auditorium, millions of eyes across the U.S. and the world linger on the image of these two graceful, sharply dressed, seemingly confident, and irritatingly artificial men as they appear on television screens across the globe. The audience can’t help but remind themselves that one of these two gentlemen will soon become the most powerful person on the planet. It’s the second U.S. presidential debate of the 1988 campaign that … wasn’t exactly the most exciting campaign in history. Bush’s Democratic opponent, Michael Dukakis, stands opposite him, donning a crimson spotted tie that gives some visual contrast against his grey suit and hair. A man of short stature and big ideas. Smiling and waving. In a brief moment, his political career is about to die. Michael Dukakis doesn’t seem as taken aback as everyone else is. He immediately springs into his answer—stating that no, he wouldn’t favour the death penalty in this case. He declares that the death penalty doesn’t deter future crime. He describes how his state, Massachusetts, has had the “biggest drop in crime” and the lowest murder rate in any industrial state in America. Dukakis wraps up his answer seeming apparently satisfied. And that was the day Michael Dukakis was finished. Finished as a presidential candidate. Finished, arguably, as a politician. Nationwide, Dukakis was blasted and bashed as “emotionless” and “robotic” for his response. The public demanded how and why he could simply excuse the man who hypothetically raped and killed his wife. Analysts and critics called him cold, calculating, heartless, unfeeling. Dukakis is too committed to the liberal agenda to actually pay heed to death, life, and justice, they claimed. And after Bush won the presidential election by a landslide (to put it gently), Michael Dukakis’s political reputation never recovered. The problem? Dukakis did absolutely nothing wrong. There was nothing questionable about his answer. He rightly stated his belief that the death penalty did not deter future crime (and whether or not you agree with that belief, the presidential debate is essentially a platform for reaffirming one’s position on key issues, and Dukakis made no misstep in this). He correctly pointed out that his state had an impressive drop in violent crime despite having banned the death penalty. Dukakis was clear, confident, and cool in his response—and his career coughed, sputtered, and died because of it. This brings me to the point of this essay—the debate over the death penalty has been hijacked by emotion and sentiment that doesn’t belong there. This muddling emotion has excused a culture of ignorance and denial, making it okay to ignore facts, data, and information, and pay attention instead of saying what sounds better. Getting rid of this culture of feelings-over-facts is essential especially in regards to the death penalty when human lives are literally on the line. Michael Dukakis offered nothing but fair facts and a fair stance, and he was ravaged by crowds who believed he wasn’t emotional enough—which, by no stretch of the word, should be seen as a strength in intellectual discourse. And this intellectually compromising culture of toxic emotion has led much of us to believe that the death penalty is a justified, well-deserved consequence for violent crime that will make future criminals think twice before causing problems. But a closer, more honest, and more objective evaluation of the death penalty brushes at an underlying, uncomfortable truth—killing someone, even if they did something very wrong, serves very little benefit in the long run and achieves nothing to speak of. The death penalty is not justice. The death penalty, in fact, is an aberration of justice—a violent act that only satisfies violent tendencies and accomplishes nothing in terms of deterring future crime. A fundamental element of the justice system is the importance of deterrence—structuring consequences and penalties in a way that will discourage future potential criminals from committing a similar crime. Imprisoning a man convicted for murder does nothing to atone for the murder, it only serves to dissuade future murders—either by the same manor as an example for those willing to follow in his footsteps. Without deterrence, there is very little meaning behind any guilty verdict. Establishing that someone has committed the crime is the first step; punishing her or him as an example to discourage future similar acts of crime is the second, indisputable next step. That’s the basic skeleton of the justice system as it should be. The death penalty is nothing but an abnormality in this system. It is a violent act, yes—there is no doubt that the taking of a healthy life is always violent. But does that mean it’s a fair response to another, original, monstrously violent act? Do some people—mass murderers, serial rapists, child molesters—deserve death as a means of justice for the atrocities they have committed? Are some crimes so inexcusable that allowing the perpetrator to live is a crime in and of itself? Questions like these completely and totally miss the point of this discussion. There is no way to quantify or objectively evaluate whether or not one deserves a punishment for a certain act. Such a decision would be entirely subjective—too subjective to be a part of a country’s justice system. And hence even a discussion about whether the death penalty is “deserved” for a certain crime would have very little value and helpfulness. One could claim that execution is not deserved for a crime, and another could counter easily by claiming that it is deserved—and no actual evidence could be shown by either side. Therefore, this essay will not waste time arguing that a death penalty is not deserved, or is. Instead, what’s more important, relevant, and helpful is this: the realization that allowing the death penalty would normalize a justice system that responds to violence with violence, can be easily exploited for political suppression, and fuels social inequality on multiple dimensions. 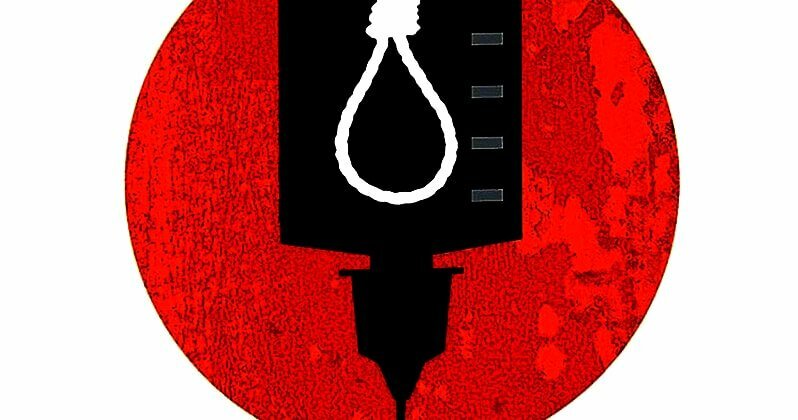 The question is simple: does the death penalty stop crime? At first glance, the answer may seem obvious. Yes, of course—the fear of death would clearly discourage people from committing crime. Which seems to make natural sense. Except for that decade of research and analysis have thoroughly discredited this idea. International bodies like the UN Human Rights Council, Human Rights Watch, Amnesty International, and the European Union have cited widely circulated research as a basis for their decision to encourage countries to ban the death penalty (see: the Second Optional Protocol to the International Covenant on Civil and Political Rights, European Convention on Human Rights, American Convention on Human Rights, et cetera). Years upon years of research—demonstrating that the death penalty had no appreciable effect in terms of lowering violent crime rates—formed the basis for a general global consensus that killing criminals aren’t an effective way to stop crime. In the U.S., 88% of leading criminologists do not believe the death penalty is an effective crime deterrent. Just as one example out of many, a study by Columbia Law School looked at Hong Kong (which had banned the death penalty in 1993) and Singapore (which actively maintains the death penalty for murder and other serious crimes) and found no meaningful difference in crime rates. Another instance: in the state of New York, the death penalty was reinstated in 1995 and then banned again in 2004; decades-long analysis showed no difference in criminal activity before, during, or after the changes in legislation. Similar studies in a range of locations across the world have reached almost identical conclusions. Which brings me to another equally important point—the death penalty has taken innocent lives before; it is doing so as you read, and it will continue to do so long after you’re done, until and unless it is struck down globally as unlawful and unethical. Since 1973, a staggering 153 people have been freed from death row as they were found not guilty—whether it be due to false testimony, flawed evidence, forced confession, mistrial, or more. And that’s just the number of people that were found to be innocent before they were killed. How many innocent men and women sit on death row, awaiting their execution for a crime they did not commit, as of right now? How many are already rotting six feet in the ground because death arrived before the discovery of their innocence? The socio-political impacts of the death penalty are complex and manifold. It greenlights a system in which public courts have the power to grant a human life or death. While this may not seem altogether too dangerous, think for one moment about the political biases inherent in public administration systems across the globe. Think of the Kingdom of Saudi Arabia issuing death by torture to critics of the government and state religion. Think of the People’s Republic of China denying investigative journalists the right to legal aid and sentencing them to death or life in jail while they have been forcefully stripped of all defense in court. Think of the Republic of Iraq in which a failing, faltering government has but a fumbling grasp over clumsy, unregulated national courts headed by judges whose rulings are as subject to personal and political breezes as the rest of the nation’s social structure is. 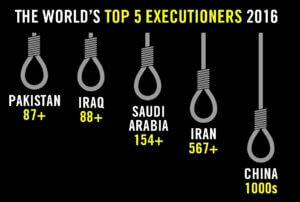 In fact, according to Amnesty International, “in 2017, the most known executions took place in China, Iran, Saudi Arabia, Iraq and Pakistan”—all countries with a reputation for socio-political repression. It is telling that the countries with a tendency to maintain more draconian, illiberal laws—very limited media freedom, blasphemy, and anti-free expression laws, forced political alignment—also are the most avid practitioners of capital punishment. Further research by organizations like Amnesty and Human Rights Watch make it clear that illiberal countries like Iran and Sudan utilize the death penalty as a tool to kill and frighten political dissidents. But, you may ask, how is that relevant to the death penalty in the United States, or France, or the rest of the developed world? One nation’s crimes do not necessarily mean another nation’s justice system needs reform. The reason one nation’s behavior, especially in the case of legislation (and particularly in this case), should be wary of situations in other nations is that of the issue of precedent. Approving of certain legislation, especially when the decision is controversial, sets a precedent for other nations to consider as acceptable. 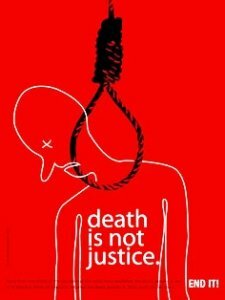 Allowing the death penalty in a developed country normalizes the death penalty in another country, either as or less developed. The United States is one of the very few developed countries that has not yet banned the death penalty has undeniably set a precedent and created a role model for much of the world to follow, considering it okay to institutionalize the death penalty on their own soil. In simple terms, legalizing the death penalty in a developed country makes it easier for other countries to legalize it and abuse it, as it sets a positive example—basically announcing to the world that a civilized nation has decided that killing criminals is fine and healthy. Banning the death penalty in one’s own country is the first step towards making sure it is not used as a political tool for suppression in other nations. Practically speaking, it would simply not make diplomatic sense to call for the end of capital punishment in another country when the same barbaric practice is ongoing back home. The death penalty serves as an engine for social and economic inequality, except that in this case, the consequence of this inequality is quite literally life or death. It is a fact of life that the wealthier have better immunity from the law, better access to the best legal aid, more influence over courts and public officials. The poorer and the impoverished have much lower and less effective access to legal aid and defense. It should come as no surprise that the richer folks convicted of the same crime routinely face lower sentences and more lenient penalties than their less wealthy counterparts. Is it really acceptable to allow one’s financial background to be a determining factor in whether one is literally executed by the government? These percentages and statistics are just the tip of the iceberg that is racism, present in various forms in various countries. Minorities are more heavily targeted and penalized for the same crime than racial majorities—a fundamental but saddening truth that should be taken into account when evaluating something as violent and irreversible as the death penalty. The taking of a life is no small matter. People on all sides of this debate understand that I’m sure. Those who support the death penalty do so with good intentions—they believe that some acts are so evil, so cruel, so unforgivably heinous that death is the kindest ending we can bestow upon those who commit them. And sometimes, it’s hard to disagree with that sentiment. Sometimes it’s hard to see why someone who raped a nine-year-old child, someone who slaughtered a family for no visible reason, someone who delves into the darkest corners of human action—why these people should be allowed to live. But let’s not make the problem worse. Let’s not throw support behind a practice that will further jeopardize an already flawed justice system. Let’s not condone a practice that has been known to take hundreds upon hundreds of innocent lives. Let’s not accept a practice that exploits social inequality in the worst way possible, by making a person’s death contingent upon their social status and background. Let’s instead devote money into more worthy causes. Educational campaigns in underprivileged neighborhoods that reek of crime. Reformation programs for convicts who knew nothing but violence and abuse all their lives. Reparations for wrongly imprisoned people who spent decades behind bars. Financial aid for communities that have no option but to steal and kill for basic resources. A death penalty is a tool found useful by tyrants, oppressors, and elitists. It is a disservice to justice. It is a disservice to us. Adeeb Chowdhury is a writer, debater, and aspiring diplomat currently living in Seattle, Washington as part of a US State Departmental exchange program. He is the president of the Youth Internationalist Association, a contributor to various magazines, Model UN enthusiast, and a member of various institutions such as JSA (Junior Statesmen of America). Besides writing and politics, Adeeb is interested in old movies, stand-up comedy, and early 2000’s hip-hop music.